Culture defines any business, but it’s one of the hardest things to manage. In this extract from her new TED Book, Margaret Heffernan lays out the often-overlooked element necessary to build an effective, efficient organization: social capital. Running a software company in Boston, I recognized — and my board told me — that we needed to reposition the business. Our product was too bland, too generic to stimulate excitement or loyalty. I needed a team to help me, and I ended up working through the problem with a motley crew: a young web developer, a seasoned and eccentric media executive, a visual artist, and me. We spent a week in the private room of a burger joint, exploring options, rejecting easy answers, pushing one another to find something none of us could see. Looking back, I recall that intense period as one of the most thought-provoking learning experiences I’ve ever had. The team was outstanding — and successful — but why? How did such an eclectic combination of people manage to work together so well? What made this experience of creative conflict so productive? You could argue that we had a lot of brains in the room — and we did. But we also had something more important. We had social capital: the trust, knowledge, reciprocity and shared norms that create quality of life and make a group resilient. In any company, you can have a brilliant bunch of individuals — but what prompts them to share ideas and concerns, contribute to one another’s thinking, and warn the group early about potential risks is their connection to one another. Social capital lies at the heart of just cultures: it is what they depend on — and it is what they generate. In a fascinating study of collective intelligence, Thomas Malone, together with a team of MIT researchers, analyzed groups that proved exceptionally effective at creative problem solving. Their goal was to identify the salient features that made some teams much better than others. What they found was that individual intelligence (as measured by IQ) didn’t make the big difference. Having a high aggregate intelligence or just one or two superstars wasn’t critical. The groups that surfaced more and better solutions shared three key qualities. First, they gave one another roughly equal time to talk. This wasn’t monitored or regulated, but no one in these high-achieving groups dominated or was a passenger. Everyone contributed and nothing any one person said was wasted. The second quality of the successful groups was social sensitivity: these individuals were more tuned in to one another, to subtle shifts in mood and demeanor. They scored more highly on a test called Reading the Mind in the Eyes, which is broadly considered a test for empathy. These groups were socially alert to one another’s needs. And the third distinguishing feature was that the best groups included more women, perhaps because that made them more diverse, or because women tend to score more highly on tests for empathy. What this (and much more) research highlights is just how critical the role of social connect- edness can be. Reading the research, I can see my old team. We were all smart enough and had a wealth of different experiences, but no one deferred to anyone; that made us curious about what each could offer. We knew we needed an answer but we also knew that no one of us had it; we would have to work together to craft something we could not make alone. At times we were frustrated, scratchy, impatient. But nobody had any agenda. We all cared passionately about our shared success. In all of this, we’d been lucky; but can’t we do better than luck? When I described Malone’s research to a conference of five hundred business leaders, one asked whether it was possible to teach empathy. Did you have to hire for it — or could it be developed inside teams and companies? On the face of it, hiring for empathy — the ability genuinely to imagine how the world looks through the eyes of others — is fundamental. Customers and colleagues won’t see everything as you do and sharing others’ perspectives is how we learn. But none of us enters the workforce fully formed, and crucial skills always have to be developed. Teaching empathy reminded me of Carol Vallone. She’s now run three successful businesses, but when I first met her, she ran WebCT. The company was the result of the merger of her Boston-based, venture capital–backed business (originally called Universal Learning Technology) and a Canadian nonprofit. The cultural differences made Vallone confront the challenge of pulling a disparate bunch of people into a smart, functional team with empathy and respect that were not guaranteed. When it came time to draw up the company’s annual budget, each department head drew up a budget for that department — but then had to explain it so cogently to one colleague that the colleague could defend it at the leadership team meeting. The chief technology officer would argue the case for marketing, the head of sales spoke on behalf of operations, customer care explained technology’s needs. The impact of this simple exercise was profound. Everyone had to see the whole company through eyes not their own. They felt duty-bound to do the best job possible — if only to ensure their counterpart did likewise. They had to listen to everyone, not just wait their turn. In effect, Vallone was teaching empathy: getting each executive to see the company through the eyes of others and to appreciate the vital connections and dependencies between one another. In large organizations, I’ve seen pairs of people choose to work out their problems this way. A functional head will challenge a regional head and then they will reverse roles. This way, they learn the exigencies and contingencies of both positions; they start to see common themes, ways they can help and support each other, and empathy grows. While many people recoil from conflict because they fear it will endanger their relationships, the paradox is that honest conflict — during the hard work together — makes social connectedness grow. When we avoid the argument, nothing happens. Only when we both engage in debate is our capacity to see each other’s perspectives realized. It’s the mortar, not just the bricks, that makes a building robust. The mortar, in this context, is social capital: mutual reliance, an underlying sense of connectedness that builds trust. The idea of social capital grew out of the study of communities and what made them survive and flourish in times of stress. But the concept takes on vital importance when applied to organizations that are now routinely beset by change, surprise, and ambiguity. At work, no less than in communities, social connectedness plays a critical role in making individuals and companies more resilient, better able to do conflict well. Building social capital sounds like an abstract idea but it derives from an accumulation of small actions. When I talk to business leaders about this, many of them have reexamined small initiatives that fundamentally transformed their organizations. One told me about the silos of his business: geographical regions and technical functions found it hard to connect and trust one another. He’d asked that each make short films about one another. He wasn’t expecting anyone to invest much effort in the project but went to the trouble to gather the entire company in a cinema to watch what they’d made. The outcome startled him: movies of immense passion, inventiveness and humor that delighted, motivated, and inspired the whole company. “I didn’t realize it at the time,” he told me, “but I guess building social capital was what we were doing.” Making the films meant the teams got to know one another; being in each other’s films made them care about one another. Giving the activity a name made the CEO appreciate that getting people to invest time in the group was a fundamental business need. Some companies now ban coffee cups at desks, not to protect computers, but to ensure that people hang out together around the coffee machine. ASE Global won’t let employees eat lunch at their desks. In part, this is to ensure that everybody takes a break. But both policies create the opportunity for people to know one another. The Swedes have a term for time together at work; they call it fika. It’s a moment when everyone gathers for coffee and cake, dispenses with hierarchy, and talks together about work and non-work. The word fika signifies more than a coffee break because it fosters a sense of togetherness. The Swedish researcher Terry Hartig calls this “collective restoration,” arguing that the synhronicity is what gives the time its social and business value. When Alex Pentland studied the communication patterns at a call center, he recommended that coffee breaks be rescheduled so that everyone in a team took a break at the same time. On the face of it, this didn’t sound efficient, but providing that one opportunity to build social capital yielded the company $15 million in productivity gains — while employee satisfaction increased by up to 10 percent. Not bad for a coffee break. I didn’t know any of this when I started my first software company. We had gathered plenty of young, smart, energetic, motivated people who all worked furiously. But everyone was so focused on tasks and targets that there was little give-and-take. Everyone worked hard, but they worked alone. Even in the first year, turf warfare threatened: engineers thought marketers made too much noise, and accountants thought salespeople were awfully expensive for people who were always absent. Work was being seen, and executed, as a transaction; the relationships between people weren’t growing. What I devised was so simple I still feel awkward writing about it. On Friday afternoons, we stopped work early, got together, and listened as a few people told the whole company who they were and what they did. Some used PowerPoint — others performed sketches, wrote songs, or told stories. We learned about one another. An engineer had worked on one of the first Internet browsers, a marketer had devised a famous tagline, a Russian designer had taken huge risks to leave her home country. You watched respect grow. Ten years later, the same process in a completely different business yielded similar results; work between people became more direct, open, and fearless as executives came to see human value in one another and to gain trust. Social capital grows as you spend it; the more trust and reciprocity you demonstrate, the more you gain in return. Work at MIT has quantified this. Alex Pentland’s team tracked the patterns of communication of teams in a wide range of organizations from hospitals to banks to call centers. They discovered that those patterns of interaction were as important as everything else (individual intelligence, skill, personality, the contents of discussion) combined. What happened between people — not just at meetings but in casual conversations, brief exchanges in the hallway, at the water cooler — made a measurable difference in productivity. And his tracking quantified what we’ve all felt — that the real influencers of an organization are the network nodes: the people who most often intersect with the most people. Their titles may not signify power, but that’s what they have — and it is through them that social capital compounds and change accelerates. Within academic circles, the scientist Uri Alon (TED Talk: Why truly innovative science demands a leap into the unknown) is famous for breakthroughs on the boundary between physics and biology. But he is more widely acclaimed for a 2010 paper “How to Build a Motivated Research Group.” (Scientists are closely akin to entrepreneurs in the sense that success hinges on identifying hard problems and solving them — often in a race against time.) Alon knows time is precious but he still devotes the first half hour of his weekly two-hour meeting to “nonscience”: birthdays, the news, the arts. This might appear to reduce the time for real science — but in the long term, Alon says, the gains from increased motivation more than make up for the losses. When the group moves on to discuss science, he assigns each member a different role — as imaginary referees or brainstormers — which helps to structure the constructive conflict within the lab. All of this, he says, builds the social connectedness on which every scientist will rely when they hit the difficulty and confusion that always accompany scientific breakthroughs. For Alon, social capital is what makes those discoveries possible. Investing in the connections among team members both increases productivity and reduces risk. The National Transportation Safety Board found that 73 percent of incidents occurred on the first day a team worked together, and 44 percent on the first flight. By contrast, flight teams that stayed together for years performed better than all the rest. The late Richard Hackman’s research into teams showed that superior teams tended to be very stable; they work together for a long time, getting to know and trust one another. Switching people in and out didn’t make them more creative — it was disruptive and dangerous: newness was a liability. Shuffling roles within a stable team produced enough change, while preserving the value of familiarity that develops from working together over time. Even in research and development, where new talent is needed to refresh ideas and knowledge, Hackman concluded that the introduction of just one person, every three or four years, would suffice. Without high degrees of social capital, you don’t get the vigor of debate and exchange that hard problems demand. Creativity requires a climate of safety, but without social capital, no one will risk the fresh thought, the unpredictable idea, the testing question. That even the finest talent needs social capital became clear when I heard a CEO describe an organizational failure. He told the story of a hugely gifted executive who had been transferred from Hong Kong to the European headquarters. Everyone had had high hopes for him — but after he arrived, he foundered. Disconnected from his team, deprived of social capital, his intellect alone was insufficient — yet when he returned to Hong Kong, he was again a superstar. Remarkably, the CEO concluded that the individual hadn’t failed — the organization had. It had failed to appreciate the degree to which IQ alone isn’t productive; it needs support, safety, candor, connections and trust to thrive. Social capital isn’t about chumminess. It doesn’t mean work colleagues have to become best pals or that good cheer is a permanent requirement. Many of the greatest teams are scratchy, sharing an impatience with anything less than the best. Grumpy orchestras tend to play better than cheerful ones; they’re focused on performing better, and happiness is the output, not the input, of their work together. In organizations with high degrees of social capital, disagreement doesn’t feel dangerous, it is taken as a sign that you care; the best thinking partners don’t confirm your opinions but build on them. They know that every idea starts out flawed, incomplete or downright bad. In organizations with high degrees of social capital, conflict, debate and discussion are the means by which it gets better. Building social capital makes organizations more productive and creative because high levels of trust create a climate of safety and honesty. That makes companies more efficient and profitable, too. How? By making it easier to ask for help. Helpfulness may sound like a rather anemic quality, but studies of teams across industries as varied as paper mills, banks, pharmaceuticals and retail all demonstrate that the helpfulness of a group has a direct impact on profits, costs, productivity and efficiency. Helpful teams of people accelerate the sharing of knowledge and expertise; they don’t let one another stay stuck or confused; they try to prevent problems before they arise and they won’t let colleagues become isolated or cut off. Social capital compounds even as we spend it. And the longer groups work together — the more social capital they accrue — the more these benefits grow. Trust, helpfulness, practice and courage become the simple renewables that power our working lives. 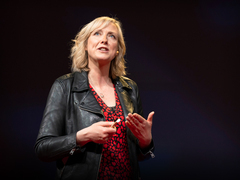 Margaret Heffernan The former CEO of five businesses, Margaret Heffernan explores the all-too-human thought patterns -- like conflict avoidance and selective blindness -- that lead managers and organizations astray.